San Juan de Porto Rico, June 5,-The french engineers who are to build the island railway arrived here on May 27 by the steamer Ville de Marseille from France. The proyected railway will connect the various ports of the island. The local government has guaranteed 8 per cent interest for a term of years. The railway franchise which the Executive granted yesterday to the North American Company is very valuable. It will permit the construction of a veritable network of lines in the island. Attorney General Thinks Exemptions Awarded to Porto Rícan Railway Were Unwarranted. WASHINGTON, Aug. 19.—The Secretary of State has received from Attorney General Knox an opinion on the question on the approval by the President of a franchise granting to the Compañía de los Ferrocarriles de Porto Rico the right to extend íts railway línes between certain points on the island. The Attorney General advises that the franchise In question be not approved by the Presldent, on the ground that the Executive Council of Porto Rico has undertaken to exempt the company and its property from all taxation for a period of twenty-flve years. These exemptions, the Attorney General holds, the Executlve Council was not authorízed to make. " Congress," he says, " did not delegate to It the sovereign power of taxation, including the authority to exempt from taxation. This was delegated to the Legíslative Assembly of Porto Rico. The two powers are different and dlstlnct things." The Council, therefore, it is held, has invaded the province of the Legislative Assembly, and the proposed exemptions are void. ALBANY. 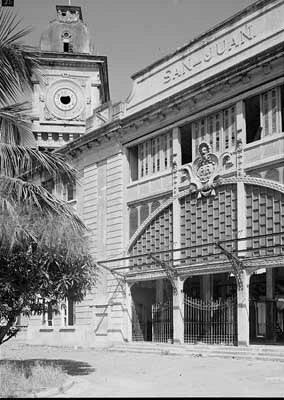 May 10.—The American Railroad Company at Porto Rico, with its principal office in New York City, was incorporated today, to operate a narrow-gauge steam road which has been partially built and is being operated at present between various cities and towns of the Island of Porto Rico by the Compañía de Los Ferrocarriles de Puerto Rico, a Spanish corporation. The total length of the road is to be 307 miles, about 130 of which have been constructed. The corporation is also to operate or to lease or acquire Porto Rican telegraph and steamboat lines in connection with the railroad. The company has a capital of $1.000,000, of which $400,000 is to be 7 per cent, cumulative preferred and $6OO.OOO common stock. The Directors are J. de Lapisse, Henry Wiener, Paul Leveque, and Gabriel Maurel of París. France; Edward Lauterbach. Herbert R. Llmburger, and Hernand E. Behn of New York City; Jean Charles Charpentier of San Juan, Porto Rico, and B. P. de Frece of Pelham Manor.
" All the papers are at my office and the figures I give you are practically guess work. Between Ponce and San Juan there are three railroads, or more properly speaking, three sections of what should be a continuous road. These were built under a Spanish grant and the securities are mainly held In France.
" Our company has completed arrangements to take over the roads now in operation and make it a continuous route. We have the concessions from the authorities at Porto Rico, and these have been ratified by President Roosevelt. By the terms of our grant we can Issue first mortgage bonds. and there will be no trouble about capital. In all we will have to build about fíty-five miles of road, and work will be begun at once. When completed the raílway will be about 135 miles in length." SAN JUAN, Porto Rico. March 28— James Peabody of Chicago,-the railroad expert detailed to advise and assist the Governor of Porto Rico In adjusting rail-road rates and revising the freight classification now in use, after completing his investigation of the railroad transportation conditions of Porto Rico and submitting a lengthy report on the subject to Gov. Post, sailed for New York on Tuesday on the steamer Coamo. Mr. Peabody stated in his report that the American Railroad Company was in absolute control of all the lines; that the rolling stock was old and inadequate to the needs of the increasing shipping interests; that the business methods were antlquated; that preferential rates were given; that poor discipline prevailed, and that the roads were operated under a franchise of the Spanish Government which precluded the Executive Council from ínterfering wlth the present conditions. Mr. Peabody recommended the adoptlon of a system by which the roads might be operated profitably, based on their former earníngs and probable increases during the next five years, and the formulation of a set of rules governlng the passenger traffic.